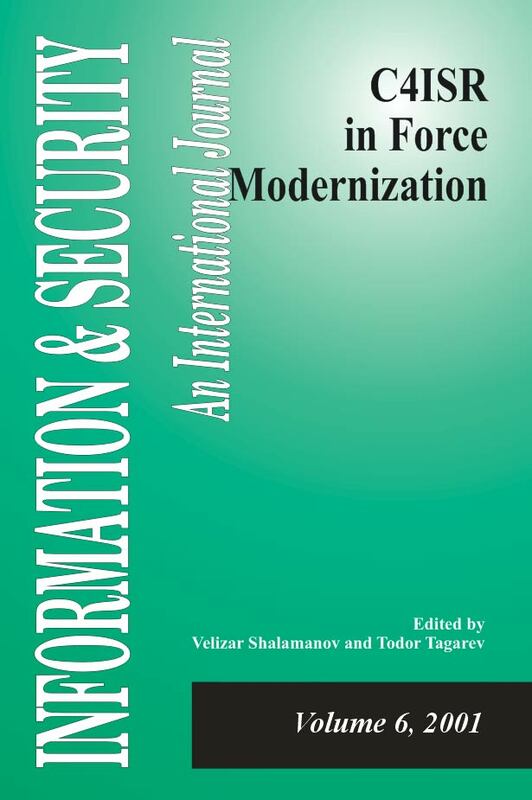 This volume presents a series of articles on the role of command, control, communications, computers, intelligence, surveillance and reconnaissance (C4ISR) technologies in defense reform. Particular emphasis is given to the application of C4ISR to modernizing the Bulgarian armed forces. Three new developments are presented in the “Monitor” section of the volume - concepts for creating a “C4 Common Technical Architecture Development Coordination Group" and a "Virtual Defense College for Distance Learning," both in the framework of the Southeast Europe Defense Ministerial (SEDM) process, and the newly created Center for National Security and Defense Research at the Bulgarian Academy of Sciences. Editorial. "C4ISR FOR Advanced Defence Capabilities and Security." Information & Security: An International Journal 6 (2001): 5-6. Wiener, II, Daniel, and John Courtien. "Bulgarian Information Network: Command Information Infrastructure for the Future." Information & Security: An International Journal 6 (2001): 55-68. Naidenov, Alexi. "Computer-aided exercises in training commanders and HQ staff: Note on Bulgarian Experience." Information & Security: An International Journal 6 (2001): 105-114. Nachev, Atanas. "Testbed for implementation of advanced IT Participation." Information & Security: An International Journal 6 (2001): 132-137. Shalamanov, Velizar, and Nikolay Petrov. "C4 Common Technical Architecture Development Coordination Group." Information & Security: An International Journal 6 (2001): 153-156. Ratchev, Valeri. "SEEDEFCOL - Virtual Defence College for Distance Learning in South East Europe." Information & Security: An International Journal 6 (2001): 157-166. Monitor, ISIJ. "Center for National Security and Defense Research." Information & Security: An International Journal 6 (2001): 167-169.